OMG this was such a cute book! I love panda’s and can’t resist their cuteness and reading this book was not less than a wonderful treat for my eyes and soul. Not only is it freaking adorable, but it is one of those children’s books that teaches a very important lesson that sometimes we all need a little help and guidance to achieve our dreams. It is a story about Papa Panda and cub going out for a walk to enjoy the night sky. They find a nice hill to sit and watch the stars. A dazzling star catches cub’s attention and he asks papa panda that why it is brighter than the rest of stars. Papa panda says it is a wishing star and if you make a wish and if the star feels that your wish is worth granting then its magical powers will make it come true. 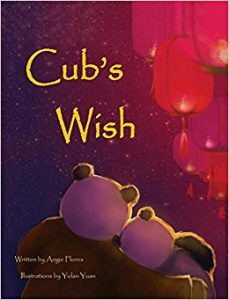 Cub is excited at the thought of his wish coming true but soon realises that wishing on star is so hard as he has everything he could ever ask for. He asks his father about his wish and papa panda says that he always wants to feel as happy as he is now. Cub asks his father if he can share his wish and focusing on star he wishes to be as happy as he is in this moment. Beautifully done!! Thank you, Angie Flores, for writing such a wonderful book and sharing this with me. I also cannot wait to share with my 5 year old niece. The illustrations are extremely adorable and colourful. It captures the Beautiful Bond Between papa panda and his cub…hugging each other and watching the stars together. This book is a must read for parents and young children as it showcases the parent and child relationship beautifully and can be a great addition to children’s bed time routine. This book gets complete five stars from me! 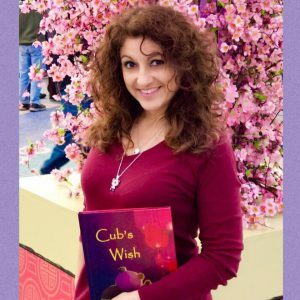 In case you missed it, be sure to check out Angie Flores appearance on the reading With Your Kids podcast. Give your child an access to Abukacha’s Shoes and over 20,000 more great books for free for two months! Click on the banner below and use the promo code Jedlie to try Epic for free for two months.